Don't miss out on the chance to own this like new home! 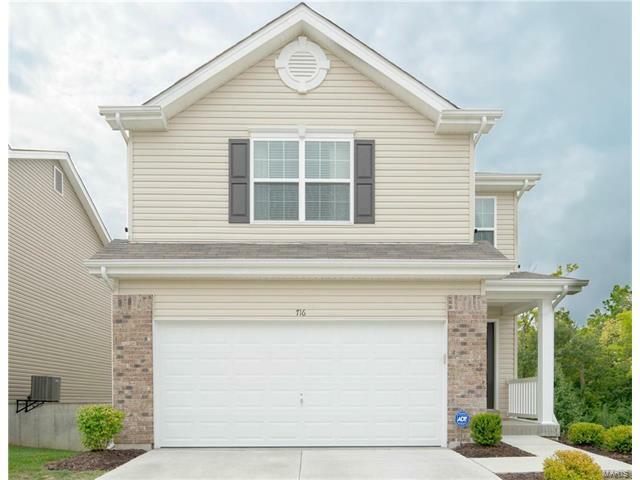 Located in the recently developed McBride and Sons Springhurst Neighborhood, this 3 bed, 2.5 bath home offers over 1700 sq ft of open floor plan with a walkout basement! Kitchen offers a breakfast bar, gorgeous dark wood cabinets and stainless steel appliances. Bay window provides all the natural light you need! Beautiful master suite offers a separate tub and shower, double vanity and two large walk-in closets. 2nd Floor laundry is located right at the top of the stairs for convenience. Roughed in bathroom in the large basement that's waiting for your finishing touches! You also get access to the private neighborhood pool/basketball court! Great location in the Wentzville School District, close to Highway 364/40 interchange, easy access to shopping and restaurants. Make this YOURS today! From HWY 40, West on 364. Turn Left on Hawk Ridge Trail. Turn right on Springhurst Pkwy. Take second exit at the traffic circle to stay on Springhurst. Turn left onto English Ivy, house is on the right.